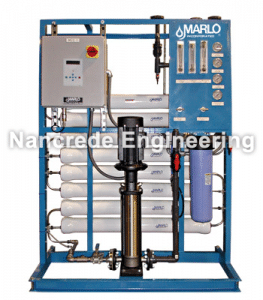 NECO’s Highly Efficient Reverse Osmosis Systems are designed for medium to larger ultra high-purity, commercial and industrial applications requiring very high quality water (98-99% salt rejection). Nominal output capacities of 10,800-28,800 GPD (7.5-20 GPM). Horizontally arranged reverse osmosis membrane housings for maximum product output with the minimal smallest floor-space requirements. SDI or Portable DI (deionization) Exchange Tank Systems can be added to this after the RO system to change it from a high-purity to an ultra high-purity water system. High rejection, 4″ x 40″ thin-film composite (TFC) membrane elements in a spiral-wound configuration. Skid-Mount Packages – RO machines are available with the necessary pre-treatment and re-pressurization equipment mounted to a structural carbon steel skid and pre-piped/pre-wired to the fullest extent. Greatly reduces installation time and costs. Not available for 18,000-28,800 GPD models. Clean-in-Place Packages – For periodic cleaning of the membrane elements to remove mineral scale and biological fouling. Includes a skid mounted and pre-wired transfer pump, batch solution tank, inlet filter housing, isolation valves, and quick disconnect cleaning ports. Recommended for 18,000-28,800 GPD models to maximize membrane life and significantly reduce operating costs.